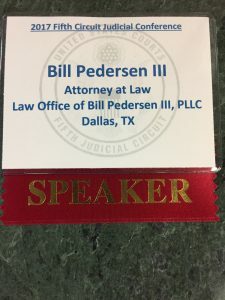 Bill Pedersen, III, of the Law Office of Bill Pedersen, III, PLLC, along with Robert Tobey, of Johnston Tobey Baruch, and Nathan Johnson, of Spector Johnson, PLLC, spoke at the 2017 Fifth Circuit Judicial Conference at the Gaylord Texan Resort and Conference Center in Grapevine, Texas, on May 10, 2017. This invitation only conference is held annually for the judges of the Fifth Circuit, along with the finest practitioners in those courts. Almost every federal judge in Texas, Louisiana, and Mississippi was in attendance. 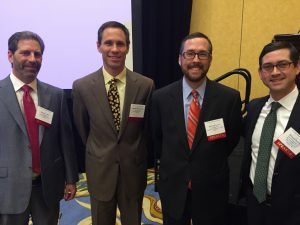 Mr. Pedersen, Mr. Tobey, and Mr. Johnson, gave a presentation on legal ethics, in a discussion moderated by Michael J. Bentley, a member of the Board of Governors of the Bar Association of the Fifth Federal Circuit. Mr. Pedersen, third from the left, was honored to address such an august assembly.